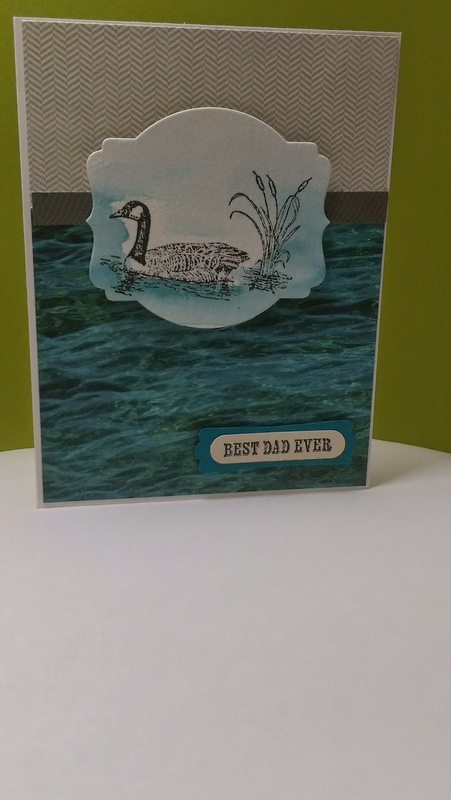 I got to come home and head into the craft room this evening and decided to work on a card for dad...Father's Day is just around the corner! I decided to use Moon Lake since it will be going away very soon. Yes, I got to get a sneak peak into the up coming 2015-2016 Annual catalog and Moon Lake did not make the cut....but OMG! There is so much awesomeness packed into that catalog that I can barely contain myself to wait until 6/2! This is going to be the hardest 4 weeks to wait for a catalog to go live EVER! Speaking of catalogs, if you would like a catalog, please let me know and I will make sure that you get one. Just use the "contact me" link and provide me your name and address and I will be sure to get one to you once they are available, OH MY! Wait until you see the new In-colors,,,,can we say GORGEOUS!! And the best part...they blend with the 2014-2016 In-colors! And the new stamp sets? To die for! New ribbons and embellishments and awesome new dies for the Big Shot!!! Ok, without further ado, here is the Dad's day card!